Across the world, overwhelming numbers of children – some as young as a few months old – have experienced violence, be it to them or them seeing their parents partake in domestic violence. In Guyana, this newspaper has published numerous reports of domestic violence where mothers are brutally beaten or killed in some instances. Unfortunately, it continues despite awareness efforts and the much-touted training of law enforcement officers who are expected to be the first step of recourse with regard to the lodging of complaints. There are countless campaigns, policies and strategies aimed at addressing the impact of such violence against women. But what is often overlooked is how such abuse affects the numerous children and young people who witness and perhaps experience it. Exposure to such events would affect you in some way. In fact, the effects might have lasted into children’s adult years, for example, affecting their outlook on life, love and relationships. For a child, witnessing a parent being abused can be traumatic and can have lasting, and sometimes devastating effects on their academic development and personal growth. Too often, children are forced to bury their heads under a pillow to drown out the constant yelling, spend consecutive nights crying and praying it would all end, or sometimes, are compelled to rush to their parent’s defence in a desperate bid to offer protection. 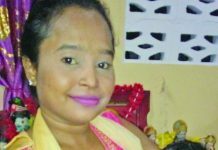 Cases of the latter are very evident in Guyana as reported in June 2018 when an enraged man killed his wife and subsequently his own daughter, after she tried to save her mother. All of this unfolded before his son, who was merely 11 years old at the time. All of this can take a huge toll on a grown-up, much less a kid who already has difficulties trying to understand algebra. A research paper published by a US social worker surmises that children’s exposure to domestic violence and intimate partner violence is extremely prevalent and those children are considered at a higher risk for problems in holistic development. Research also shows that children who witness domestic violence performed on average 12.2 percentile points lower than children whose parents reported no violence in the home. Just a few days ago, the Department of Education in Region Three in collaboration with the Ministry of Social Protection hosted a workshop aimed at training teachers to identify and help students who may be struggling with violence at home. The workshop facilitators recognised that exposure to domestic violence can hinder a child’s ability to learn, and as such, the initiative prepared teachers to deal with the situation holistically. Not only were teachers informed of coping mechanisms, they were acquainted with information about resource groups, agencies and various support services. This initiative is highly commendable and much needed. It needs to be further developed and rolled out in a robust manner across the country. In Guyana’s context, where intimate partner violence and domestic violence are so prevalent, it is imperative that such a programme is taken seriously and that teachers genuinely try to help. There needs to be an established protocol for teachers and other educators to follow when dealing with children who are exposed to domestic abuse. Of course, there also needs to be systems in place to help teachers help their students. This is because teachers can find themselves in uncomfortable situations if they decide to help a student dealing with domestic violence issues at home. A 2013 study conducted among elementary school teachers in the United Kingdom found that educators themselves struggled with having to send the children back to a potentially abusive home. The study indicates that this is line with secondary trauma theories, where confidants of abuse victims may themselves experience trauma. Teachers also develop fears that family members may retaliate or that the abusers in a student’s life may in turn start to abuse the teachers.